What’s left to say about Nosferatu? It’s among the most visible of silent films today; perhaps only Metropolis (1927) has been seen by more people. In notoriety, it follows The Birth of a Nation (1915), but more people talk about Birth than have actually seen it. I’ve seen Nosferatu five times, I think; each time a different print with a different score. Ah, there’s my way in. The version of Nosferatu I’m going to write about today is a fresh one; it begs new perspectives and a realignment of critical focus, and so yes, there are things left to say. I’m referring to Kino International’s masterful new restoration, Nosferatu: Ultimate Edition. The film quality on these discs is the best of any restoration I’ve seen—you can count the hairs on the hero’s head as he dresses for his journey to the Carpathians. It is a sleek and potent presentation, all around. But the music is what did it for me—Hans Erdmann’s original score, authorized by director F.W. Murnau, raised from the dead by the Saarbrücken Radio Symphony Orchestra. The music, right from the start, forced me to think again about what Nosferatu is about, at least from the standpoint of the men who made it. Nosferatu, it turns out, is a dark comedy. Alas, there are two ways a great silent film can be funny today. The first is because its humour is timeless, as Keaton’s and Chaplin’s humour tends to be. The second is because the film has aged badly for one reason for another. Combine this with an unsympathetic audience, and the results are pathetic. The scene is hilarious. And if a moody organ drone were played over top of it, we’d suspect Murnau wasn’t in on his own joke. But instead, we’re given flutes and clarinets—music to skip through a meadow by. 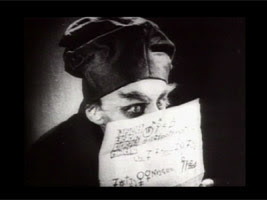 There are other moments of humour, particularly in the first half of the film. 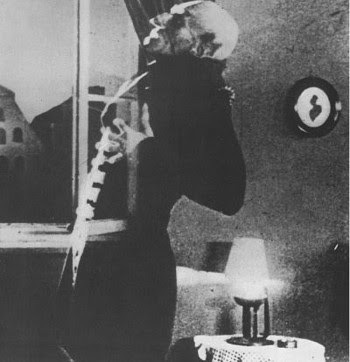 Hutter simply does not know how to react to Orlock (Max Schreck); as a businessman, he must stay dignified and accommodating to his client, but here is a client too strange to imagine—one who functions in the night and measures time by a mechanical skeleton that chimes every hour. It is a classic gag scenario. And Orlock’s one-liners are as good (and as bad) as Bela Lugosi’s would be nine years later. 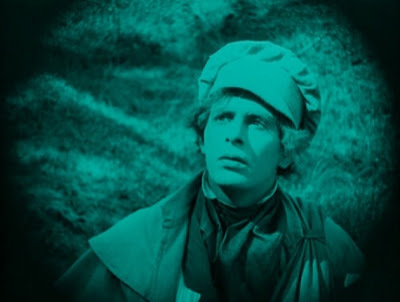 Seeing a cameo bearing Ellen’s face, Orlock compliments the woman’s ‘lovely neck.’ When Hutter decides to go to bed, Orlock begs him to stay up a while longer: “I sleep by day, dear fellow... completely dead to the world.” Hutter’s in way over his head. Call this one more example of Murnau’s brilliance—a rather under-emphasized facet of it. Unlike every director to follow him, Murnau had no ‘vampire movie’ template to work from (at least, as far as I know). Nevertheless, he and screenwriter Henrik Galeen correctly intuited the silliness every vampire movie must have. See, unless it’s From Dusk till Dawn (1996) we’re watching, we know damn well there’s a vampire coming eventually. Every misunderstanding and misstep the characters make before that vampire appears has an element of camp. Try not to grin whenever someone offers ‘Count X’ a glass of wine, or a walk in the sunshine. It’s always this way when we know more than the characters do. Nosferatu isn’t funny all the way through—especially after Orlock sails for Hutter’s German home town and brings the plague to every port he stops at along the way. Nor is it ever ‘scary,’ at least, in the Halloween (1978)-sense. 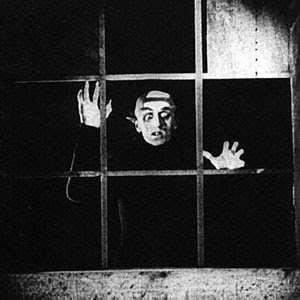 Nosferatu’s modern descendants are films like The Exorcist (1973), which excel at maintaining feelings of unease through the distortion of the mundane. Murnau delivers us familiar objects, actions and environments, but always with a twist that makes them abnormal. Sometimes this involves camera tricks, but more often, the context is enough. There are so many examples. When Hutter gorges himself at a Carpathian inn, the proprietor warns him of a werewolf on the prowl—but all we see is a fox scurrying through the woods, followed by a scene with agitated horses. The scenes have no necessary causal relationship, but we are caused to wonder if the animals fear something unseen. Left at home, Ellen falls into melancholy and eventually, into a trance. She stares without direction or recognition. She even sleepwalks on a balcony ledge. Ellen has no reason to believe her husband is safe, but neither does she have reason to believe he’s been harmed. When a sunny letter arrives from him, she takes no pleasure in it at all. Like the creatures in the forest, she instinctively knows something is amiss; her grave demeanour combats her husband’s disposition, preventing Nosferatu from descending into farce. 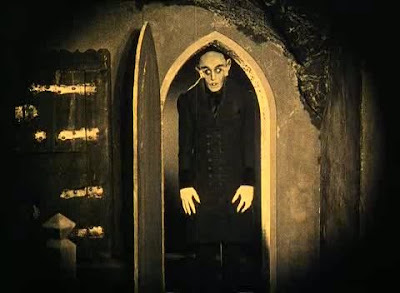 For me, the most disconcerting scenes in Nosferatu are the most artificial. Orlock is a creature of nature, yes; several scenes establish his vampirism as a trait present in other species, such as the Venus Flytrap, spider and a ‘polyp with tentacles.’ However, Murnau also makes Orlock appear supernatural by portraying him moving at fantastic speeds. The director accomplishes this through ‘undercranking,’ a technique you can learn more about here. The results are bizarre and at first, absurd; but let me tell you why they work for me. In my essay on King Kong (1933), I suggested that the giant ape’s obvious fakery made it frightening in an otherworldy sense, rather different than the effect won by photo-realistic models, such as those used for Jurassic Park (1993). To make King Kong scary requires deliberate suspension of disbelief on our part, because, while we are looking at an obvious fake, the heroine acts as though the monster is quite real. Hutter’s case is different. When he sees Orlock’s carriage approach him at more than fifty miles per hour, or watches from his tower window as the vampire stacks coffins on a wagon bed in—it seems to us—fast forward, Hutter is seeing what we see. This impossible speed is now as possible as any mundane thing Hutter does otherwise—it all rests on the same plane of reality, and so Nosferatu meshes, in its most unnatural, unsettling way, the realistic and the abstract. Have a look at one of these scenes, starting at 8:40. It’s liberating to visit this famous film in such a different way. Finally, I appreciate Nosferatu’s artistic scope—encompassing not only horror, but also comedy, its unexpectedly close cousin. Nosferatu can, and should elicit chuckles, and we’ll no longer fear to laugh, because now, we’re sure we’re laughing with it. Kino International’s Nosferatu: Ultimate Edition is a two-disc set. Disc One features the film with English-translated intertitles, along with two documentaries. Disc Two has the film with German intertitles, subtitled in English. Look for it all here. Excellent posting on a film I need to revisit. Thanks to your terrific review, the KINO is now lined up in the Netflix queue. Nice post on the movie. Great post. The Kino version is a good one, for sure. Commenting on movies like these can be tough, given that they're from so long ago, and even more so if the intertitles were originally in German. But it was fun reading this post. Thanks Drac. If the review sucked, I know you'd be the first to tell me. The Kino version is a reminder that all films are a product of collaboration--the neat thing about silent films is that the collaboration can be fluid. A new soundtrack, a new film. Chris: As a fellow silent movie buff, I have enjoyed your analysis of so many of these films. Keep up the great work. So glad I found your site. Thanks! The blog's a lot of work, so compliments are appreciated...and encouraged! There is a version I rented from netflix in 2007 or so, that had almost like, a xylophone sounding score. It also had soundeffects. I've had no luck finding this particular soundtrack and I'm bummed, it's my favorite!